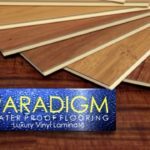 Paradigm luxury vinyl flooring is one of the most unique of its kind- its waterproof! The line is constructed as a laminate flooring and has the look of real wood flooring (wire-brushed oak). No matter the water spillage-tub overflow, dripping pool water, washing machine-Paradigm can take it! Can be installed on all grade levels. On grade, above grade, or below grade. Recommended room temperature should be maintained between 65-85 degrees before, during, and after installation. This product remains stable between 45-105 degrees. Relative humidity should be kept between 35-55%. Relative humidity does not affect product. #4 and #5 are industry standards. Can be installed over existing Sheet Vinyl/LVT/VCT. 1- Layer well bonded. Cushion vinyl and floated floors must be removed before installation. Work out of multiple boxes to insure proper color blend. Install plank flooring in a random order. Minimum end joint stagger is 8” on adjacent rows. Door jams should be undercut. Radiant heating is approved- Do not exceed 85 degrees.